Born sometime in 1994, Evan was a beautiful grey kitty with a multi colored belly resembling a tabby. My husband fell for him at the time, but I really didn't care one way or another. He was cute enough, but I was a "dog" person. We even got a dog once but took it back (stupid pet owner at that time). I didn't understand much about love or emotion having been through a rough childhood, so I made a lot of mistakes. As the marriage dissolved, the husband left never, ever to contact me again. Evan stayed. He was sad that the husband was gone, so I got him a "wife." 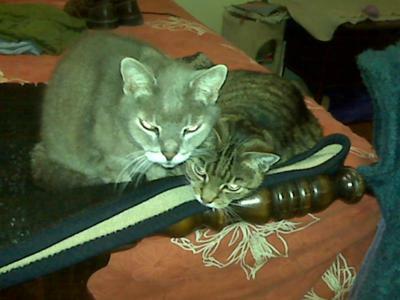 Neenie was a devoted tabby who loved Evan dearly and he loved her. OK, they were set, so I went about with my own life. Over time, these two cats became as much a part of me as my right arm. They shared my triumphs and my sadness. They were always together and always with me. They went from being OK to absolutely cherished. My life wasn't what I had hoped, but the existence of these two cats (and two more along the way) made it a lot more bearable. The loss of Evan from end stage kidney disease two weeks ago has been tough. It is a reminder that we are not at home on this world. Thank God we are not. My "family" is smaller now, quieter and the void Evan left is evident. The love for the others is great, particularly Neenie who is small and vulnerable without her Evan. Evan took a lot of my heart with him and she will take even more when it's her time. Mostly they take with them your youth and your memories of being young. I miss my one and only true friend next to Jesus. I am glad I will see him again one day. People cannot give you unconditional love, thus the reason for my definition for true friend. People cannot be labeled as such. It's simply not possible. Only animals and Jesus can give you unconditional love. That's it. As a human, you can't give it, but you can get it. True instance of it's better to receive than give. Probably the only time that is true. Look forward to the day I can go home and see my Lord Jesus and my sweet Evan again one day. Until then, love and cherish your pets. Thank you God for the gift of Evan. Besides your Son, there will never be a better gift while I am here. RIP sweet Evan, until we meet again. I'm sorry to hear about Evan. He was absolutely beautiful and reminds me a bit of a Florida panther. RIP little cat.